According to police in Macedon, N.Y., Holtz was spotted going over 100 mph in his 2005 Mitsubishi Lancer Evo last Saturday. He outran one pursuit, but police caught his trail again after he went into neighborhoods asking people to hide out in their garages because he didn't have a valid license. When police approached his car, they say Holtz reversed, rammed another vehicle, then drove at an officer and escaped over four lawns. He outran a second pursuit, dropped off a 17-year-old girl who had been his passenger, and later outran a third chase. He's wanted for attempted aggravated assault on an officer, among other charges. 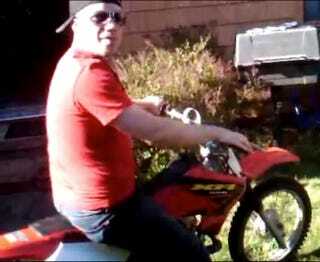 In addition to the now-deleted Facebook page where "Erik Sidewayz" talked about his appreciation of all things furious and fast, Holtz was a frequent poster on the Roclife forums, where he showed off the Evo.After forum members started taunting Holtz – including changing his profile picture to a man behind bars - Holtz weighed in himself. UPDATE 2: Holtz was caught Saturday after a brief chase on foot near his parents' business. He faces 17 charges, bail of $150,000 cash or $250,000 bond, and his Evo has been impounded. Macedon police offered their thanks to online posters for their tips.